URIL is a leading Ductile Iron Pipe Seals Manufacturer & Supplier in U.A.E. 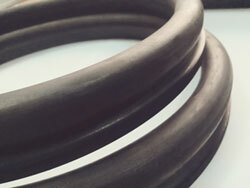 Our gaskets are standard push-fit gaskets with flexible joints which are quick and easy to install. We manufacture dual hardness Tyton type gaskets for Ductile Iron pipe in various sizes to meet the variegated needs of the customers. Our company is backed by state of the art infrastructure and a qualified team that come together to produce the best of Ductile Iron Pipe Seals. Owing to the excellent quality materials used in making the Ductile Iron Pipe Seals, they are capable of offering superb performance even under stressful conditions. Their flexible design allows them to handle angular deflection without any negative effect on the overall performance.